At least 12 soldiers have been killed in less than 24 hours of fighting between the Lebanese military and Sunni radicals in the southern Lebanese city of Sidon, an army spokesman told AFP on Monday. “An armed group loyal to Sheikh Ahmad al-Assir attacked, for no reason, a Lebanese Army checkpoint in the village of Abra” on the outskirts of Sidon on Sunday, a statement from the army said late Sunday, according to local Lebanese press. The army was reported to have said it will not stop its fight in Sidon until Assir is detained. The fighting began on Sunday when Assir loyalists flared up volence, the army said in a statement. The controversial Sunni sheikh called on his supporters last week to fire on apartments in Abra that he says house Hezbollah members. Abra is home to a mosque where Assir leads the main weekly prayers on Fridays. The sheikh believes Hezbollah uses the Abra apartments to keep him under surveillance. His supporters clashed with Hezbollah in Abra last week in fighting that left one man dead. Sectarian tensions in Lebanon have risen since the country’s Shia movement Hezbollah backed Syria’s government in the civil war there. Witnesses said machine gun and rocket fire shook Sidon, 40km (28 miles) south of Beirut, causing panic among residents. The army blamed the violence on supporters of hard-line Sunni cleric Sheikh Ahmad al-Assir. Correspondents say Sidon has been on edge since violence erupted last week between Sunni and Shia fighters who have taken different sides in the Syrian conflict. 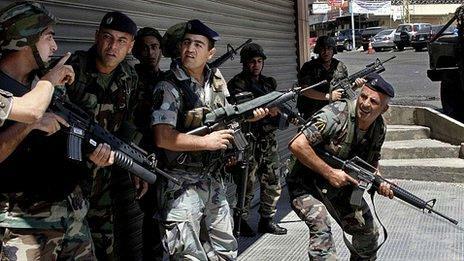 Lebanese officials have since been trying to quell the unrest. However, fresh clashes broke out on Sunday after police arrested a follower of Sheikh Ahmad al-Assir at a checkpoint, sources told Reuters. Assir was unknown until around two years ago, when he rose to prominence over his radical opposition to Hezbollah and its ally, the Damascus regime of President Bashar al-Assad. Syria-related tensions have soared in Lebanon, deepening sectarian rifts between Sunnis and Shiites. Shiite Hezbollah supports Assad’s regime, while the Sunni-dominated opposition backs the rebels fighting it. During Sunday’s fighting, Assir distributed a video message via mobile phone addressed to his supporters. “We are being attacked by the Lebanese army,” Assir said, describing the military as “sectarian” and accusing it of supporting Hezbollah chief Hassan Nasrallah. “I call on everyone… to cut off roads and to all honorable soldiers, Sunni and non-Sunni, to quit the army immediately,” Assir said in the message. The sources said despite having taken control of the complex, soldiers were still exchanging gunfire with snipers located on the rooftops of nearby buildings.